The Capital Pride festival announced it will move away from Ottawa's city hall to focus more on Bank Street and the village. The Capital Pride festival announced its parade route and programming ahead of the 30th anniversary of the event in Ottawa later this month, with a focus on Bank Street and the village instead of city hall. This year's festival, created by a new Capital Pride organization, runs from Aug. 17 to 23 and features different events each day. The pride parade will take place on the final day of the festival, a Sunday. 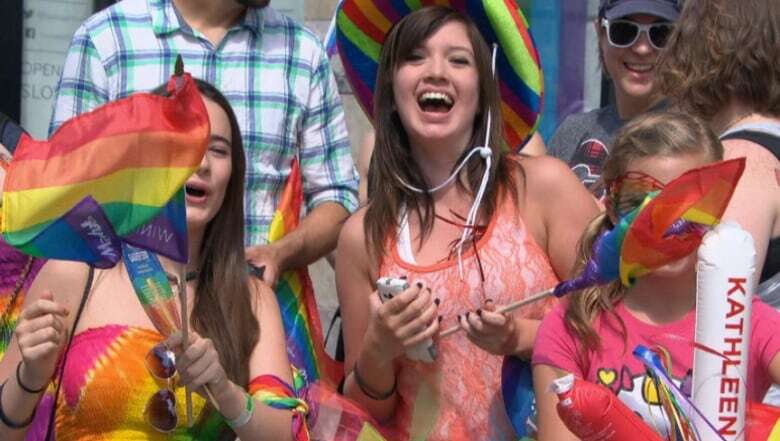 More than 100,000 people attended Capital Pride in 2014, festival organizers say. (CBC )The route will begin at Bank and Gladstone at 1 p.m. and end at Bank and Somerset at 3 p.m. The route takes Gladstone onto Kent, then moves north along Kent onto Laurier, then south along Bank to Somerset. Mayor Jim Watson and Somerset Coun. Catherine McKenney were joined by Capital Pride chair Tammy Dopson, festival producer Joanne Hughes at city hall on Thursday morning. The new Capital Pride organization was created after the former group voted in December to declare bankruptcy following financial irregularities discovered after the 2014 festival. The financial shortfall stood at more than $106,000 in December. Here are some of the details as tweeted by Matthew Kupfer.